And that’s how this came to be with me reaching out to Hektor Rasmussen and his assistant Heidi. 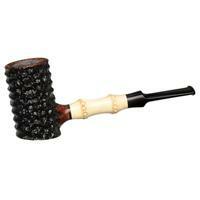 Bisgaard pipes has actually been around a long while and opened as a tobacco and pipe shop in 1963 in Vejle Denmark. It’s located to the east of Copenhagen and north of Hamburg Germany if you’re looking for it on a map. This past April the original owners Margit and Aage Bisgaard decided it was time to retire and sold the shop to Hektor. I reached out over email to Hektor as Kevin soundly said no he wouldn’t pay for my flight over there… never hurts to ask right? So let’s jump into it - as you read my questions and Hektor’s answers below I want you to take note that Hektor is Danish so the Danish to English can have some word order slightly different from a native English speaker but I wanted to leave his answers un-altered. I understand that you’ve taken over the shop from Aage and Margit Bisgaard is that correct? That´s correct, In April 2018 Margit and Aage chose to retire and I was honored to be continuing the business. Could you talk about the change in ownership, how did it happen? The reason for my interest in taking over Bisgaard Pipes is my great experience with pipes and smoke-related products due to my store “Havnens Vin & Tobakshus” which I’m the 2nd generation owner of. I have always had a great passion for pipes. 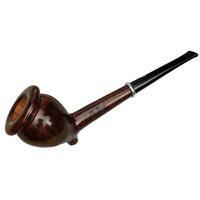 My dad was a pipe smoker and I also enjoy pipe smoking. So it was natural that I contacted Aage and Margit for a few years back, but they were not quite ready to sell at that time. So when the time came and they were ready to sell, I was very happy to be contacted by them. We found a solution where I could carry on Bisgaard Pipes. I chose to keep the name Bisgaard Pipes as it already had an established name with many customers. Hektor - what is your history or background, what made you interested in owning a pipe shop? My parents established Havnens Vin & Tobakshus in 1970, in Vejle, Jutland, from where they sold tobacco, pipes, and wine. My parents and I lived in the store when I was a child and I grew up here. My office and workplace today, actually used to be my nursery. The shop has been expanded multiple times since. 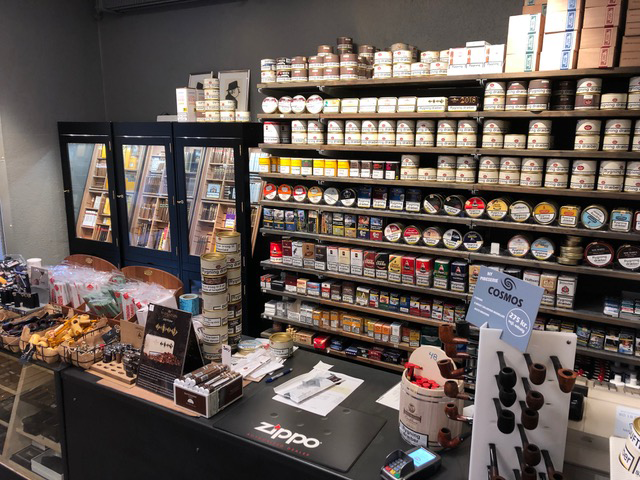 I took over the store in 2006 and today it is a well-established store and known for our smoking pipes and wine, in most parts of Denmark. It was never the obvious choice for me to take over my parents business. When I was young, I thought that my mother and father worked too much. I believe that my children feels the same way about my working hours, as I did when I was a child. I enjoy smoking a pipe or a cigar, mostly when I go hunting or when I’m outside. What can pipe shoppers expect from the store/online shop with the change? My ambition is to bring a more modern feel to Bisgaard Pipes and I want to use my network and experience from my already existing shop. Every week new pipes are added to the webshop and we have the ambition to send out a newsletter every 14 days. Do you have people visit the shop often? International visits? 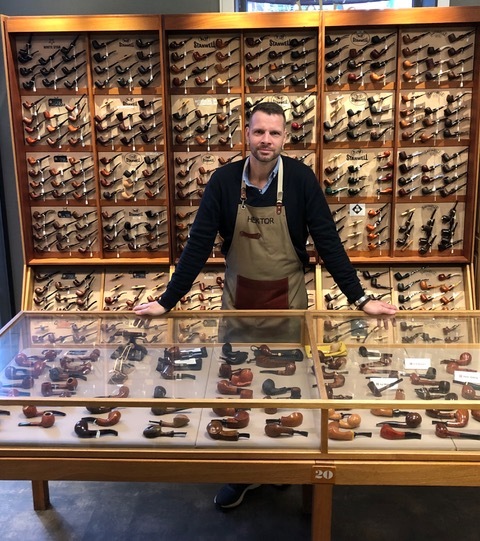 Bisgaard Pipes is primarily an online shop, but because it is part of “Havnens Vin og Tobakshus”, you can come in and buy the smoking pipes in my physical store as well. Do you have any special relationships with local carvers? Do you visit any carvers locally? In Vejle we have Erik Nielsen, who lives only a short walk from the store. I have used him as a sparring partner, in the process of buying Bisgaard Pipes. 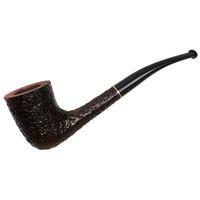 Unfortunately, Erik has been ill for some time, but I hope he will return to making smoking pipes. We have an upcoming young man, named Brian Madsen, who also lives in Vejle. Kurt Balleby lives in Kolding, which is only a 20 minutes drive from the store. And a funny little story is, that “Former (Hans Nielsen)” lives in the house next to where my mother was born and raised. It´s a small world sometimes. 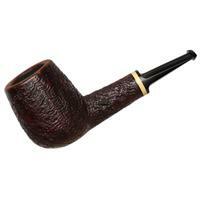 What sort of pipes does Bisgaard offer that you can’t find elsewhere? 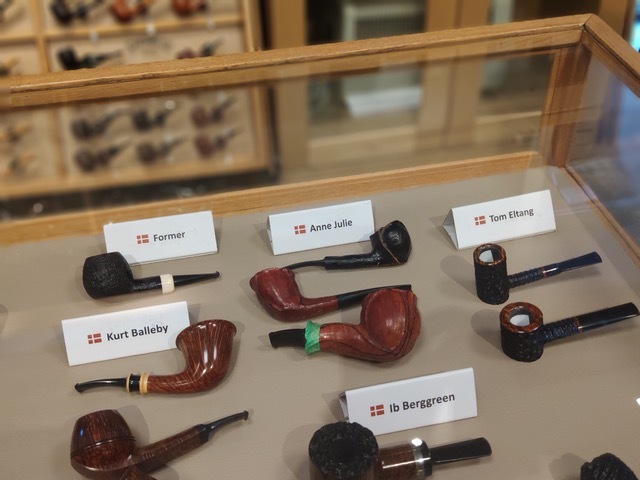 Bisgaard offers many unique smoking pipes, many of them from Danish pipe makers and I strive to find pipe makers who aren’t as well-known too. What type of carvers sell to Bisgaard? Many of the carvers are Danish, well-established and with many years of experience in pipe making, but I try to find new and young pipe makers as well because I believe they can contribute to the wide palette of unique pipes that I offer on my website. Any plans for expansion on the website or store? I also chose to put wine and spirits on bisgaard-pipes.com as well. 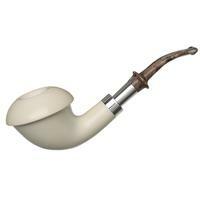 I think smoking a pipe goes well with a good glass of wine, whiskey or cognac. That is “hygge” as we say in Danish. Any plans for a website update? When I took over from Margit and Aage, I used quite a lot of resources to upgrade the website, to make it appear more contemporary and user-friendly. We update the website regularly with new products and images. What sets Bisgaard pipes apart from other retailers? We are not so different from other retailers. We all sell pipes but I try to have a large assortment in both new and establish pipe makers in the store. The company has been around since 1963, so we know the business. I also have a close relationship with many of the Danish pipe makers. The main difference is, that we also sell exclusive wine and liquor. Do you carry any interesting Danish drinks that US shoppers might be interested in? We actually have 2 different Scottish whiskey’s that are produced exclusively for the Danish market. 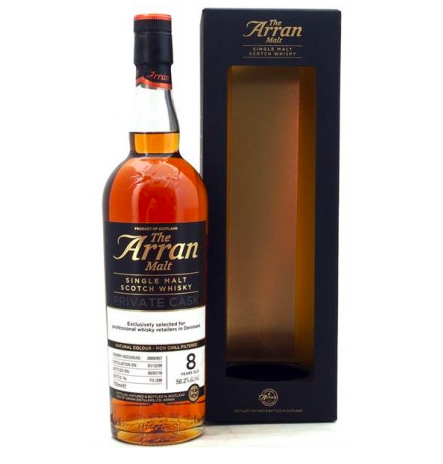 The Arran Malt is an 8 years old single malt whiskey, that comes from the Isle of Arran Distillery in Scotland. Only 290 bottles where produced. 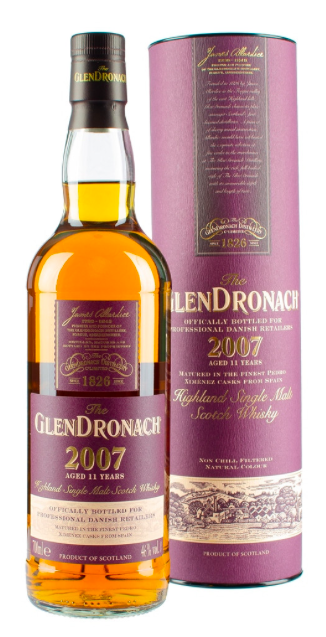 The GlenDronach 2007, is the Danish Christmas malt 2018. It is an 11 years old whiskey and approx. 3000 bottles were made for the Danish market. Common for both whiskeys is, that we drink them “on the rocks”. Last but not least, we have Schnapps. Here in Denmark, we love a good bottle of schnapps and it is essential on lunch tables throughout December. We celebrate Christmas with sumptuous lunches with friends and family. We toast in (among other liquors) schnapps, and therefore I think you should know a little about a high-quality schnapps we carry in the shop. Burnet Rose schnapps from Danish “Hr. Skov”. Burnet Rose is quite rare in Denmark and it can be found between the wild rye in the sandy dunes in northern Jutland. 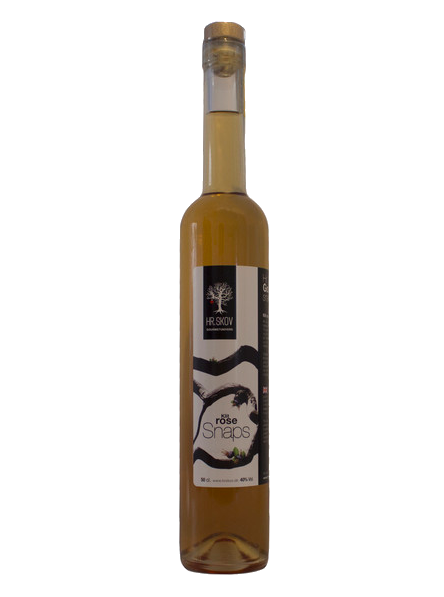 The taste has multiple impressions from the West Danish coastal nature and is rounded with a honey-like sweetness. We don’t mix it, but we drink it in a small glass made for schnapps. For US Shoppers, anything we should be aware of? Due to regulation, it is not possible to send tobacco to the US. US shoppers do not pay tax in Denmark but have to pay import tax in the US. If you are under 21 you can’t buy wine and liquor. How large is the physical shop? Do you have a lounge? The store is 260 kvm (That’s about 2800 sq feet for American readers) and we have a cozy wine cellar where we have room enough for 5-7 persons. You can´t smoke in the room, but you can enjoy a nice glass of wine or other spirits and listen to music. 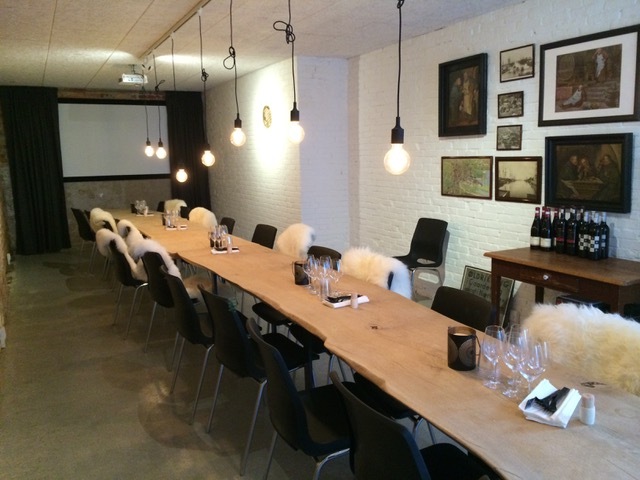 We have a room behind the shop where we have wine tasting and other social events. (Pipe smoking). This room can hold 28 persons sitting. What do you do in your spare time when not operating the shop? I have a wife and two small boys, so I spend my time with them. I am a hunter so I like spending time in nature. In the winter time, I play indoor soccer. 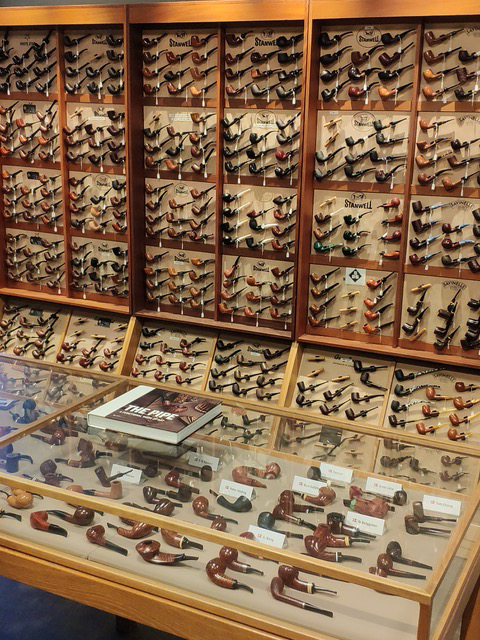 In summation, I want to wish Hektor all the best in his new ownership of the historic shop and of course it goes onto my list for pipe pilgrimages if I get into that part of the world, like most of you readers I would assume as well. Thanks to he and Heidi for helping with the article. 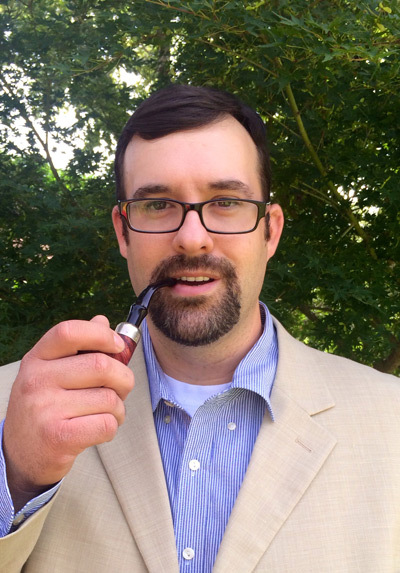 James Foster goes by the online handle of Pylorns in the forums, and he is the creator of an app for keeping track of your tobacco cellar inventory called The Pipe Tool, serves as the President of the Austin Pipe Club and is a Certified Tobacconist. Thanks for an interesting article that puts the shop on our radar. Their website will be a “de rigueur” stop when shopping for Danish pipes. Happy to learn that they are apparently thriving.